The tour begins as you enter what used to be my youngest daughter's bedroom. She moved out 6 years ago and there was a friendly argument between my husband and me on which one of us would get this room. He wanted it to display some of his jukeboxes and vintage advertising collection, but he already has the entire basement PLUS the garage. So I won, hands down. 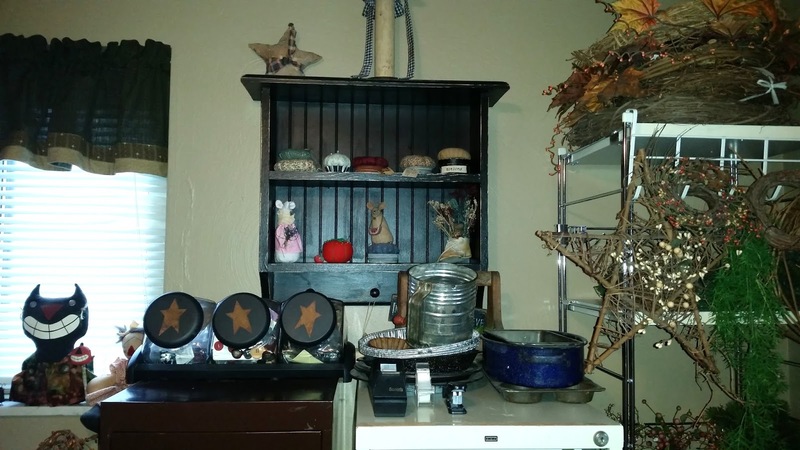 This black cube storage unit is the one I was dissing in my previous post. It just isn't worth the price I paid for it. 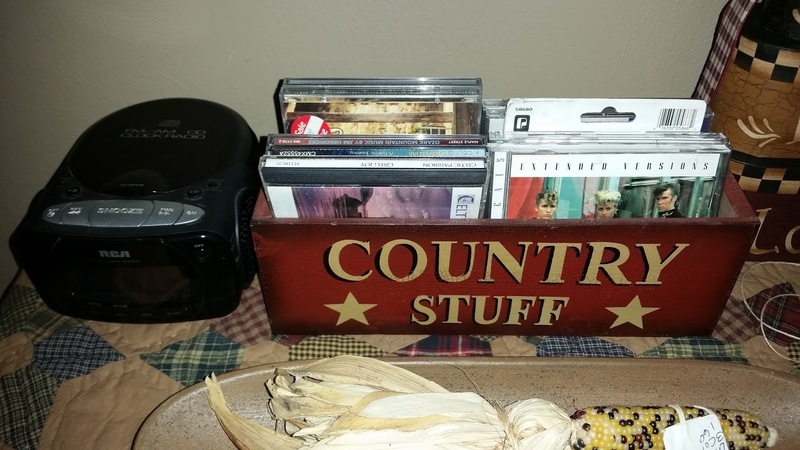 On top I have my CD player and a painted cheese box that holds my few CDs I bought to listen to while I work. Have you ever walked into a prim shoppe and heard musical instruments playing Appalachian music? I LOVE it and one of the shoppes was selling a few of their used CDs so I bought them up. 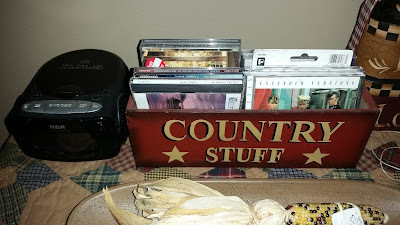 I do have a Stray Cats CD that I like to play when I am cleaning in there, gets me in the groove. 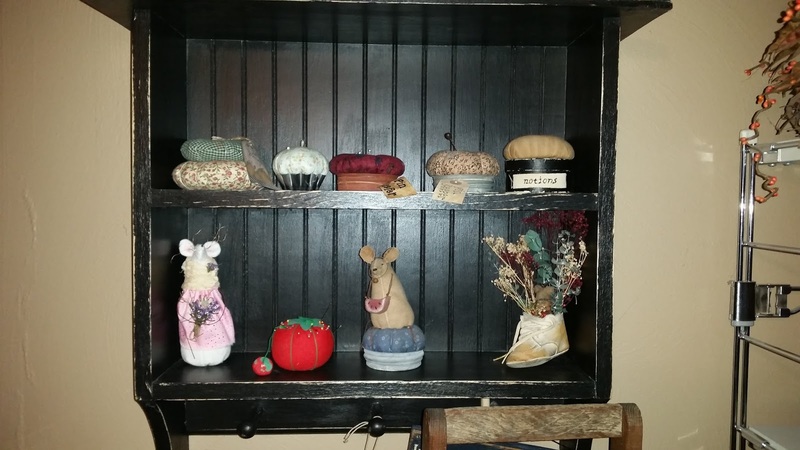 I store my wooden candle holders and vintage large spools on the shelves, and some craft magazines that have patterns still in them. 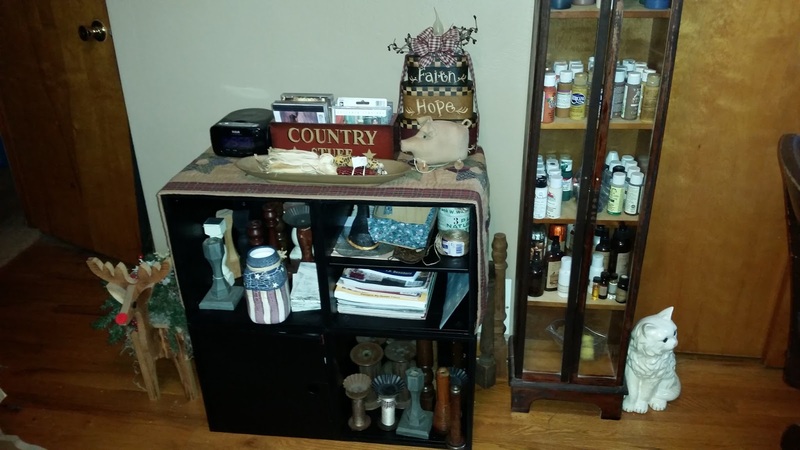 Next to this cabinet I have a wood cabinet with glass doors that my daughter's boyfriend gave me. It had belonged to his mother and his parents were retiring to Florida and was pitching it out. He thought I could use it. I could! I store my acrylic paints in it. I forgot to take pictures of the inside of the closet next to this cabinet, but I have those white plastic storage bins with large drawers ( 4 of them stacked on each other to make 2) filled with supplies like doilies, lace, wooden sewing spools, baby socks for snowmen hats, infant shoes for dolls, pumpkin stems, plastic eggs, etc. 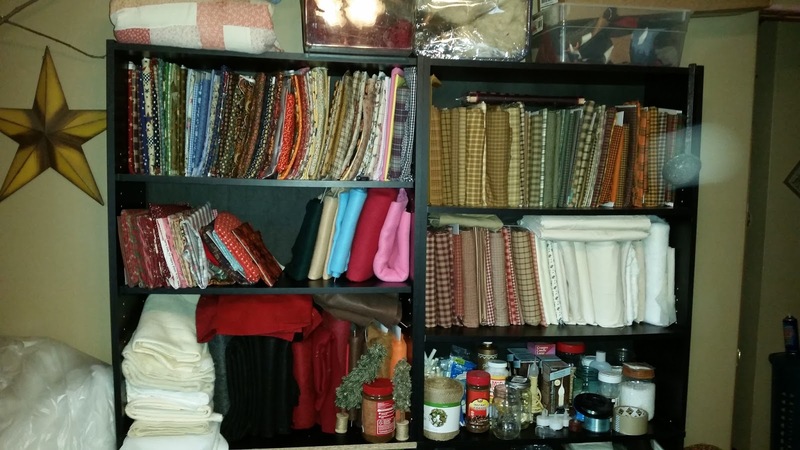 I have 2 large drawers filled with wool for penny rugs and applique. 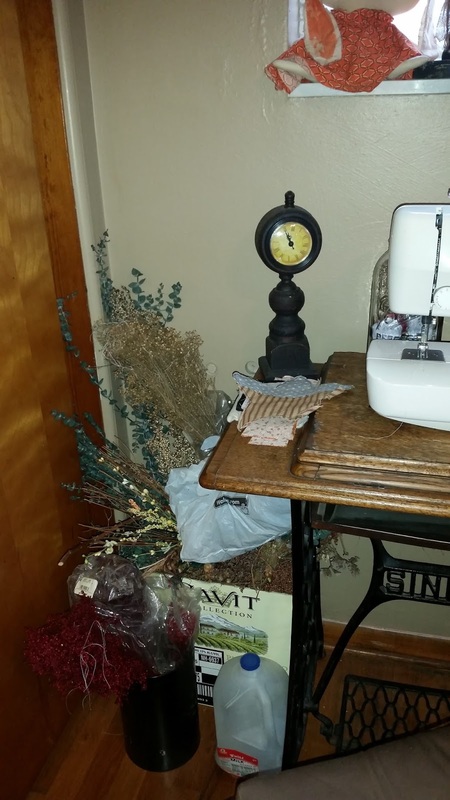 Next to the closet in the corner I keep some dried flowers. There is sand in the milk bottle that I use for weighing dolls and other items so they can stand alone. 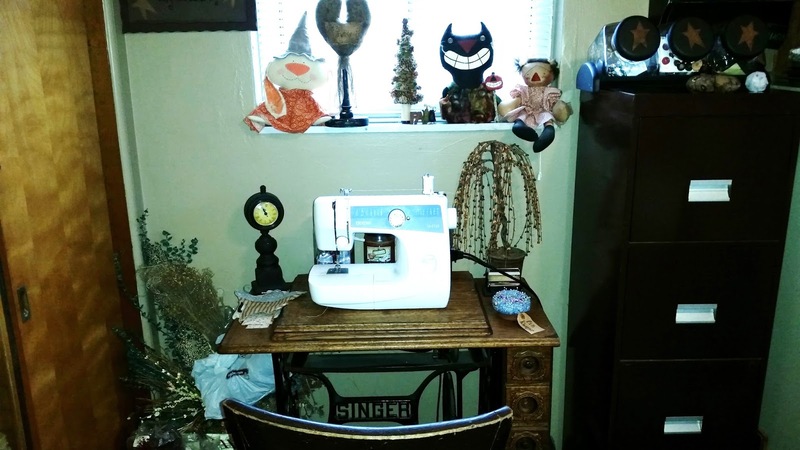 I bought the Singer sewing machine off Craigslist several years ago - it doesn't work, but I wanted it to set my own machine on. On the windowsill is a bunny, Halloween cat & doll I won in some Giveaways. To the right of the sewing machine are 2 metal file cabinets. One is brown and the other is tan. I keep my craft patterns in them, separated by seasons and Holidays. 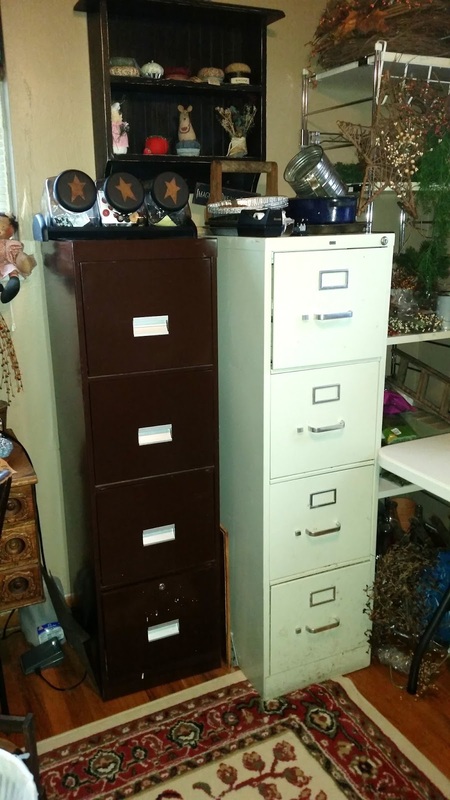 I keep one drawer only for my sale invoices, with folders for supply purchase receipts, business cards, business return labels, that kind of thing. I had been looking online yesterday for alternative cabinets for my patterns and they were quite expensive. 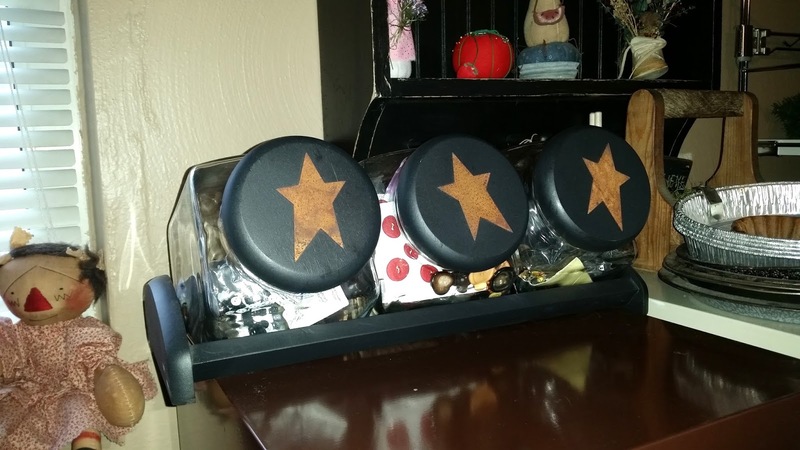 and glued rusty stars to the lids. I keep an assortment of buttons in these. Above the file cabinets I have several pinkeeps that are my 'collection'. In the right hand corner is a metal shelf where I keep my pip berry garlands, Spanish moss, preserved moss, grapevines wreaths, seasonal floral picks, styrofoam, florist foam. And now my work table. 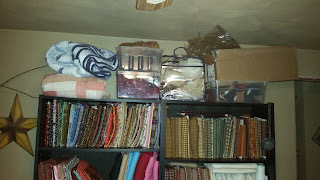 I use a utensil holder ( the kind that come with a dish drainer ) to hold my scissors, paint brushes, hemostat & chopsticks that I use when I'm stuffing fabric items. I have a thread holder next to the lamp, a ceramic mug that holds some pretty feathers that I have plans for and my light box for tracing patterns. There are 2 plastic tool bins where I keep my rusty jingle bells, safety pins, stars, hearts, beads, a lot of misc. supplies. I have 4 embroidery floss cases, with some ribbon above them in a wrought iron shower caddy. The white bins hold all my sewing needles/felting needles/sewing machine needles, stamps/ink, prim tags, and more. I have a few things under the table as well. 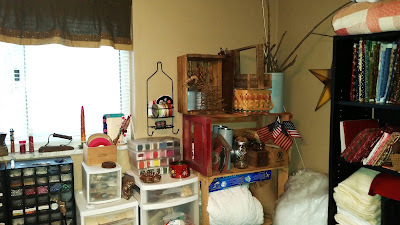 Another large white plastic bin holds my card stock, tissue paper that I use for shipping, some small wood items, and a really large basket that where I store fabric scraps. next to the black bookcase. I wrap my fabric on comic book backing boards. 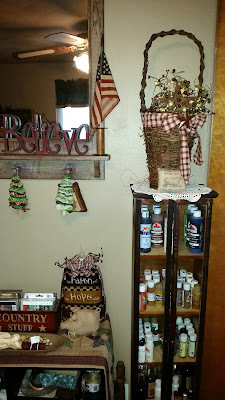 On the one shelf I keep jute, twine, instant coffee/tea, Mod Podge, German glass glitter, glitter, spray adhesive and shipping tape. 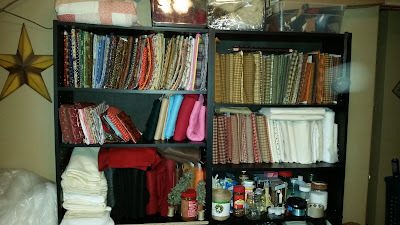 On the lower shelf I keep my frames for stitcheries. 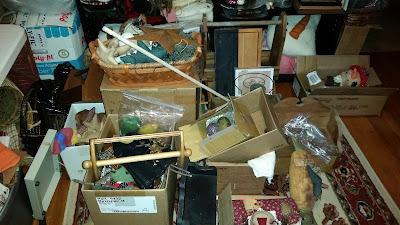 On the very top are a couple quilts for cutting up, yarn that I use for doll hair, wool roving, a box full of preserved Sweet Annie and another bin with small felt and wool scraps. 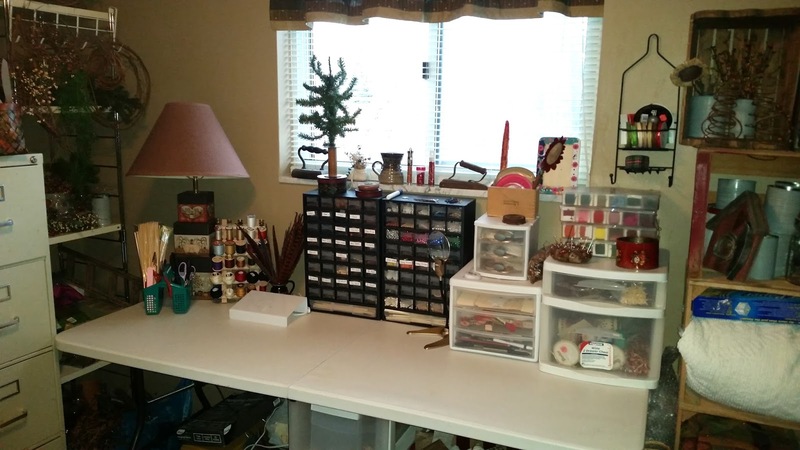 It's not fancy, it's not pretty, but it's all mine :) Thank you for stopping by to take a tour of my craft room! Love it and I am jealous. At least you have a defined area to craft and can close the door to hide it. I am all over the house and spend at least 45 minutes daily to clean up after myself before husband comes home from work.